Now you can dramatically reduce label costs, increase operational efficiencies and quickly produce high-quality color labels with Just in Time ColorTM printing on Epson's high-speed ColorWorks C3500 Inkjet Label Printer. Today there is a growing demand for the use of color labels that feature color codes, photos, and graphic images to highlight relevant information. This trend sharply drives up the number of label variations and increases label production complexity. Epson's ColorWorks C3500's ability to produce full color labels on-demand makes it the ideal solution. Epson's compact, four-color C3500 inkjet printer features fast printing speeds up to 4 ips, a banding reduction mode and a nozzle check system that produces a reliable output of labels with excellent image quality. In addition, it offers easy-to-use features such as an autocutter, easy paper loading and an LCD with printer status readouts. Epson's patented MicroPiezoÂ® inkjet technology together with its DURABriteÂ® Ultra Pigment ink ensures labels with crisp, clear, easy-to-read text and barcodes and vibrant graphics that resist smudges and water even on plain paper. And with the C3500 you can print on a wide range of media from plain paper to matte and glossy label stock. It handles roll-fed or fanfold, die cut or continuous label media. For information about compatible ink jet labels for the Epson SecurColor label printer, call us at 1.800.843.4242. PRNTR-EPSON TM-C3500-031, LAN, USB, 4-Color Inkjet, C31CD54011 Cable not included. 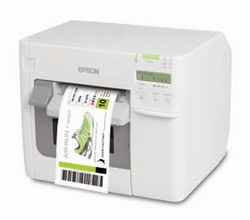 Take a quick video tour to learn about the features of the Epson C3500 inkjet label printer.